The AGM held in January was well attended with excellent presentations from the speakers Vincent Fean, former British Consul-General to Jerusalem, Huda Sameer, a former student of Jean’s in Nablus now studying landscaping in Greenwich and Birgit, a young German woman who was in Palestine helping with the olive harvest when her group was attacked by settlers. Sadly Abu Yasser’s sister, Anaya, passed away at the beginning of the year. 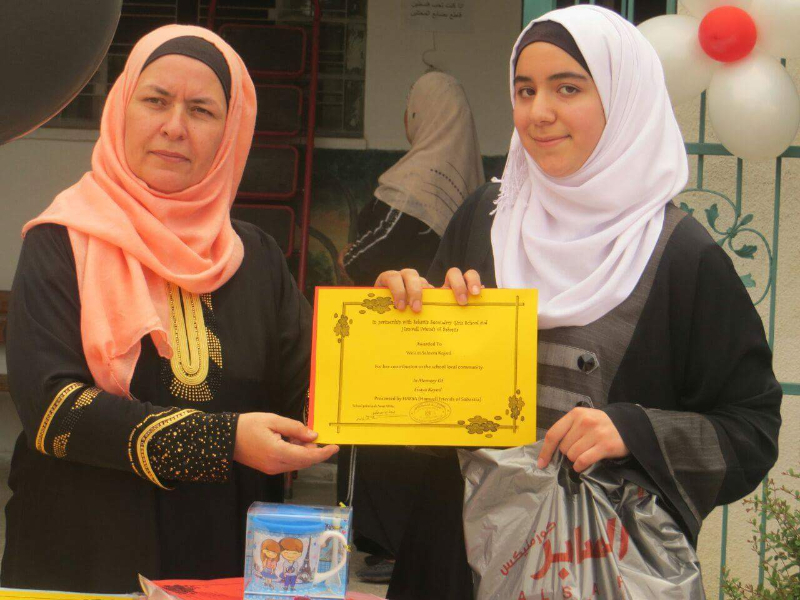 Anaya was a wonderful woman who was very active in the village community, leading the women’s co-operative, mentoring young girls, always helping out women in difficulty and leading in the setting up of the guest house. 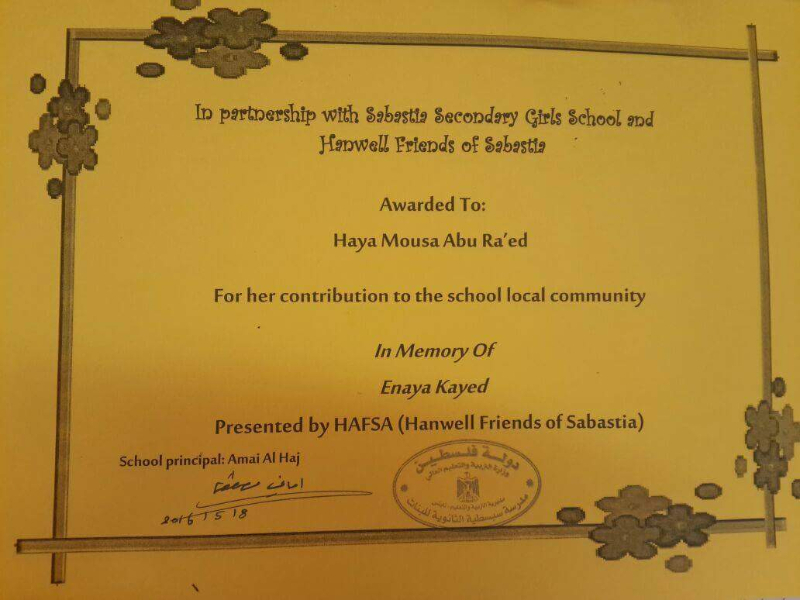 The committee will speak to Abu Yasser about setting up an annual prize in her memory to be awarded to a young girl who contributes towards the community. He has more recently also lost a cousin and a nephew. Our heartfelt condolences go to Abu Yasser and to his family. On a more positive note, he has been in contact with the Israeli Archaeological Society about protection of the ruins and further meetings have been arranged with the Minister for History. This is very good news for the village as they will now be officially involved in any future developments regarding the ruins. They are very heartened by this. Jean will be visiting Sabastiya for three weeks from 24th April and Lynne will join her for a week. 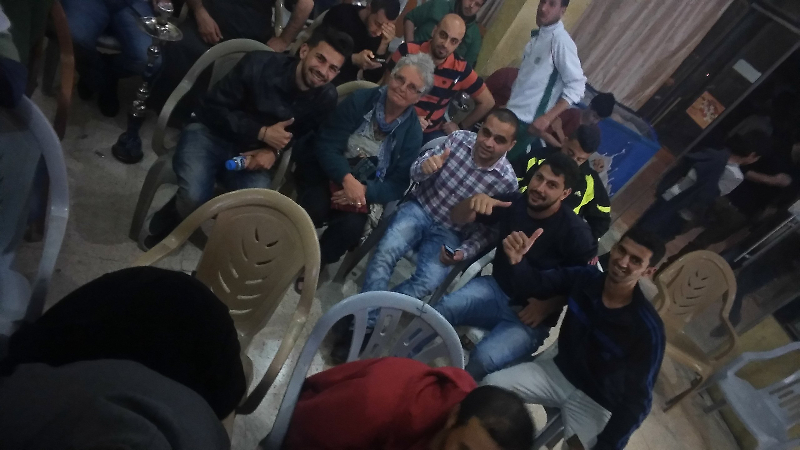 They will be meeting old and new friends and the chickens, admiring the newly planted fruit trees and bringing back Palestinian goods for Hafsa to sell. Jean is also hoping to visit an outreach clinic of SAMA, the St John’s Eye Hospital in Jerusalem which has a network of clinics run by Diana Safier throughout the West Bank. 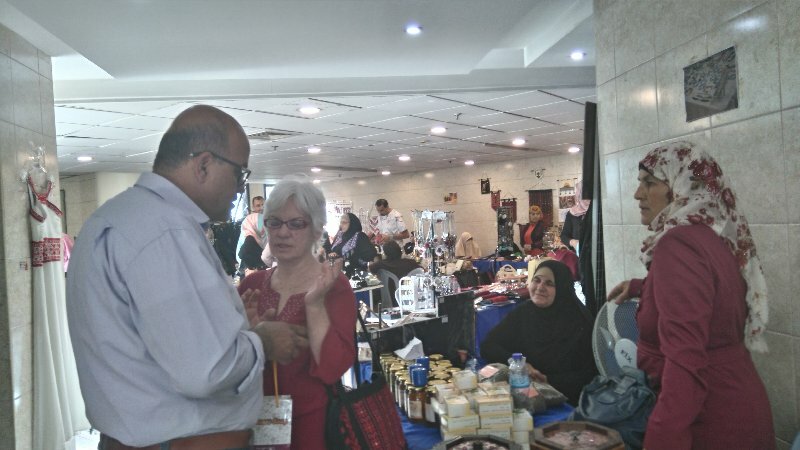 Marjorie Kelly and Kathy Tomlinson have taken over the sale of Zaytoun products so please contact them for your supplies of olive oil, za’tar, soap etc. Kathy can be contacted on 02085795282 Marjorie can be contacted on 07960804650. Zeytoun goods will be available for sale at the socials and summer festivals. In March, Hafsa sent £1,500 to buy fruit trees for 41 village families. They included almond, lemon, peach and two types cherry tree, planted in gardens and on farms. They are very appreciative of this contribution. Longer term, the committee is also exploring ways in which we can set up some form of assistance for the special needs children and young adults in the village. This will require local professional input and ideas. 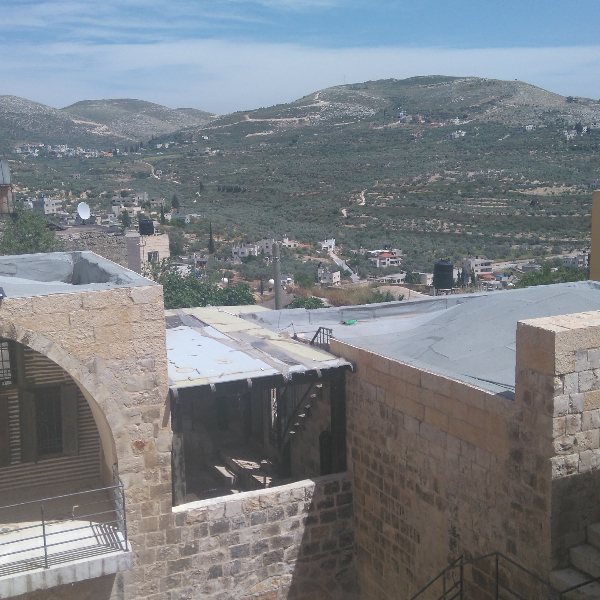 There are several schemes operating in the West Bank especially in Bethlehem. Some provide care and therapy or activity sessions while others are occupational with members making bags or felt products. This is a project that needs careful preparation and clear understanding of what Hafsa is be able to commit to in the long term. There is also a suggestion that Hafsa support a project to deal with ‘grey’ (waste) water. This again needs further research. Bree and Monika have produced a new Hafsa leaflet after stocks of our last one ran out. This will be published soon. We will be showing the wonderful Palestinian film ‘Paradise Now’ at the Northfields Community Centre on Tuesday 24th May at 7.30pm. This film by Hany Abu-Assad won the 2005 European Film Academy award for best script and was nominated for an Oscar for best foreign film. Filmed during the Intifada amid real life violence, it deals with the grim subject of suicide bombing but with a darkly comic theme running through it. Simon Quinn has studied Paradise Now in depth and will introduce it. We are trying to widen the popularity of our film showings so please bring a friend who might be interested. There will be Hafsa stalls as usual at the Hanwell Carnival (18th June) and the Brentford Festival (4th September). A Summer Social will be held at Jean and Colin’s (109 Southdown Avenue) on Saturday 16th July starting at 6pm. These socials are always great fun, delicious food and a chance to get together and to raise funds for our village projects. Next year will mark the centenary of the infamous Balfour Declaration, a letter written in 1917 which ultimately led to the woeful situation in Palestine today. Go to www.balfourproject.org for more information on it and on activities that are being planned for next year. Some members would like to participate in this and we will be planning local informative events. This may not be under the Hafsa banner if it is deemed political and therefore not within our constitution. The annual membership fee of £5 is due at the beginning of the year so a reminder if you haven’t joined for 2016. You can send a cheque to Marjorie Kelly, 5 Cardiff Road W7 2BW or make a bank transfer to the Hafsa account, Co-op Bank, sort code 08 92 99, account number 65449004. Please don’t forget to put your name in the reference box if you make a transfer.